It’s every homeowner’s worst nightmare: you come back from vacation to find a couple of inches of water in your house. This flooding can come from any number of sources: rainwater, busted plumbing pipes, or intrusion from a river, pond or lake. The important thing to realize is that the situation is manageable. Our emergency technicians specialize in responding quickly to your disaster. The most important action you can take is to call a professional quickly. Every moment you wait makes it more likely that you’ll be forced to replace all of your flooring. When your house floods, you’re likely to feel like you have no control. Luckily, you’re in control of the most powerful weapon in your arsenal: a telephone. Call us and we’ll respond immediately to begin fixing the damage. Perhaps the flooding has stopped, and you’re wondering whether your carpet will just dry by itself. Over the course of a few weeks, that certainly might be the case. You need to be worried about what starts to grow while that happens. 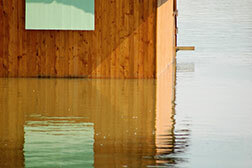 We realize that time is an important factor in dealing with flood and water damage, so we offer round the clock service. We’ll get there in time to save your flooring and protect your family. Here are the tools we employ to get the job done. Industrial Air Movers: We set up these powerful machines the moment get on the scene. Proper airflow is important to make sure that a steady draft moves bad air out of the house. Dehumidifiers: These aren’t the dehumidifiers you’d pick up in a local hardware store. Our powerful dehumidifiers quickly start to soak up the moisture in your flooring. Chemical Agents: We’ll apply chemicals to stop bacteria, viruses, and mildew from growing before they start. Our service takes care of everything from start to finish. In a matter of hours, we’ll turn your flooding disaster into a manageable situation.